cvtx Agenda Plugin [si:vi:tεç] is a WordPress Plugin which supplies various services related to online congress management. It allows the possibility to submit motions, applications etc. online. cvtx automatically creates PDF-versions of motions, books of all submitted motions and more. cvtx Agenda Plugin is avaiable as OpenSource and can be downloaded here. Requirements for installing the Plugin are WordPress (at least version 3.3) and a working installation of LaTeX (at least version 2ε). If your server does not provide these possibilities or you would prefer not to bother with technical details, check out this hosting offer. If you would like to test the system online, you can check out our demo page (please contact us for admin access). 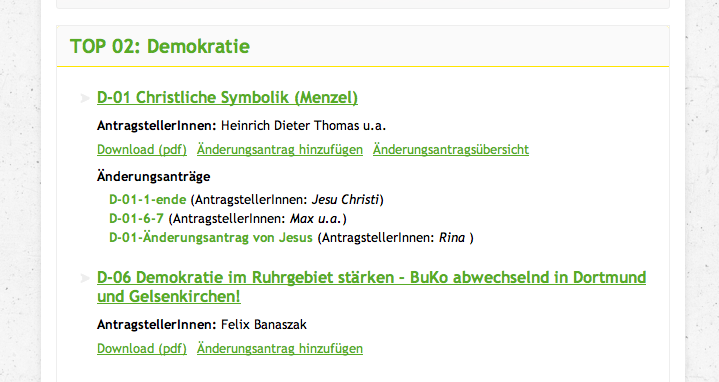 The plugin is used by the German Green Youth (Germany, NRW, Niedersachsen, Hessen, Baden-Württemberg, Bayern), the fzs, the Jeunes Écologistes and by the Federation of Young European Greens. The plugin is in active development by Max Löffler and Alex Fecke. It is licensed under Open-Source, so please feel free to contact us for suggestions and critics. There exist english and french localisation files. If you are keen to translate cvtx to your language, you are welcome!